There’s always been a quirky romance about photo booths. Their faux wood paneling and speckled Formica take you back in time instantly, and the close quarters of the single-occupancy booth mean things get cozy fast. For couples, the privacy can be an irresistible invitation to steal a quick kiss between photo flashes. Which is why this Valentine’s Day, we suggest you cross one item off your date itinerary and hit a photo booth instead. For a couple bucks you get a unique keepsake of the day and an excuse to put your arm around your sweetie. Because after the expensive dinner is finished and the box of chocolates is empty, that’s really what the holiday’s all about. STRANGE and sometimes lovely things can happen inside a photobooth. Fantasies are played out, creativity overcomes constraint and friendships are captured in eternal freeze-frame. With curtain drawn and faces expectant, the famous, the destitute and the newly smitten have all submitted to the flash of the hidden camera, transforming the cupboard-like space into theatre, playground, or artist’s studio. “Being able to close that curtain allows you to distance yourself from the world,” he says. “It becomes a place of freedom and fantasy. There’s nobody directing you. It’s a very private experience. Photobooth by Raynal Pellicer, Thames&Hudson, $55, will be released in March. Photo-Me hasn’t manufactured a new photo booth in 15 to 20 years, Gulley says. All of Photo-Me’s new accounts get refurbished, customized booths. James Photopoulos, co-owner of Photo’s Hot Dogs in Mt. Prospect, has had the same color Photo-Me booth in his eatery for 15 years. A lot of cab drivers come in and use his photo booth for their I.D. cards, he says. “I don’t know how they find out, but you can see people are coming just to use the photo booth,” he says. Fantasy has proposed putting a machine in Photo’s and is lobbying for one in his under-construction location in Palatine. In an age quickly growing accustomed to low-quality images from digital cameras in cell phones, photo booth artist and historian Nakki Goranin sees a continuing place for little closets of pictorial alchemy. She’s not the only one doing a book: Babbette Hines’ historical collection “Photobooth” ($19.95, Princeton Architectural Press) has been a hot seller for its publisher, and in 2002, MTV anthologized its collection from the photo booth on the “Total Request Live” set in “MTV Photobooth” (Universe Publishing, $17.95). And photo booths aren’t just in bars and arcades anymore. It took five months. About 30 percent of his subjects, Jerry says, gave him part or all of their photos, which will remain in his private collection. He considered part of the performance art simply convincing people to participate. Dee Taira, co-owner of the Skylark and owner of Rainbo Club in Ukrainian Village, loves the booths she has in both locations. For the last 15 years, Taira has produced a one-sheet poster, a photo calendar of Rainbo regulars using pictures taken in the black-and-white photo booth tucked behind the bar. The calendars make a pictorial history of the neighborhood and her customers. She has seen her poster in Japan and all over Europe, Taira says. People find vintage photo booth shots not only allow a greater depth of field but capture four little moments in time, like a movie strip. At Photo-Me’s U.S. headquarters in Dallas, Gulley says, he’ll get a phone call from a panicked customer every once in a while. “Are there any negatives? Who has copies of these photos?” they’ll ask. “I always play with them a little bit,” Gulley says. He’ll let them dangle, then accuse them: “You showed your [chest], didn’t you?” Then he puts the caller’s mind at rest: No, there are no copies, no negatives. Photo booths use a direct positive process, imprinting the image directly to the paper — creating a one-of-a-kind artifact. Siberian immigrant and itinerant photographer Anatol Josepho invented the photo booth in 1925 — “a coin-in-the-slot machine which would automatically develop the photographs, dry them and deliver them,” reported The New York Times in 1927. At the time, eight photos cost 25 cents. Improvements on Josepho’s Rube Goldberg-like developing process, most notably in 1946 by a California duo named Gupp Allen and I.D. Baker, made the developing more streamlined so the modern photo booth could be smaller. But instant photos lost their novelty with the rise in popularity of the Polaroid camera and its instant film. Hard times for the local dime store, longtime photo booth havens and mainstream retail chains such as Kmart and Woolworths didn’t help. Innovation — especially digital printing — further threatens Photo-Me’s corner of the market. Rival company Foto Fantasy Inc., a division of Fantasy Entertainment, offers a half dozen models of photo vending machines. For $3, Fantasy’s booths print out sticker sheets of photos, a single 8-by-10 color image or pictures that look like charcoal sketches. But whereas Photo-Me uses the classic chemical developing process for its photo strips, pictures taken in Fantasy’s curtainless booths are more cutting edge, relying on inkjet and gel printers to produce images comparable to medium-pixel digital photos. The 9-year-old company based in Hudson, N.H., has 124 machines in 76 Chicagoland locations, says spokeswoman Roberta Lemay. Fantasy owns booths in most of the area’s high-traffic tourist destinations, from Navy Pier to Sears Tower. Niles’ Golf Mill Shopping Center is a photo booth battleground. I spotted a half-dozen of Fantasy’s “foto” machines, and three Photo-Me booths. A few hours of reporter surveillance revealed about equal attention to both company’s products. Gulley says Photo-Me has about 50 to 70 locations around Chicago, although he keeps a complete list of locations and exact number of booths a territorial secret. You can generally look to hipster hangouts such as Ukrainian Village’s Empty Bottle, Lincoln Park’s Local Option and the family-friendly Bunny Hutch Novelty Golf and Games in Lincolnwood to find Photo-Me booths. Lemay calls Photo-Me “our only true competitor.” Last year, Fantasy introduced 500 Foto Fun Strips machines, which make four vertical photos, to compete directly with Photo-Me’s classic product. Five minutes into our conversation, Gary Gulley articulates my fascination with photo booths, those magical vendors of four vertical photographs. In other words, they capture the most real you. For me, finding a photo booth is like discovering a chocolate egg long after Easter has ended. They’re often stashed away in the forgotten corners of America, in the dusty backroom of bars or lost in aging arcades. As the son of Baby Boomers, I didn’t grow up in the height of photo booth popularity during the 1940s, ’50s and ’60s — but I still plug in the $2 or $3 wherever I find them. Photo booths, in recent years, have enjoyed a heightened profile. They played a pivotal role in the breakout French comedy “Amelie,” and no fewer than three photo booth books have hit the shelves in the past two years. But nationally, fewer than 1,500 vintage photo booths dot a map of the U.S., according to Photo-Me — although competitor Fantasy Entertainment has produced 3,500 “foto” machines, which use modern technology to vend digital pictures of different sizes and variations. In the post-World War II boom of the photo booth craze, more than 30,000 units found homes in train stations, tourist destinations and corner dime stores. It’s difficult to ascertain if photo booths are experiencing resurgence or if they are continuing to quietly go extinct, so I hit the road to document the state of booths in Chicagoland and nail down their cultural allure. Outside the U.S., 90 percent of all photo booth images are used for official I.D. documents. In the U.S., Gulley tells me, 90 percent of photo booth pictures are impulse entertainment buys. I’ve taken so many photo strips over the years, you could probably arrange them in a book, flip through rapidly and watch my hairline retreat. Whenever I’m under the black lights at Diversey River Bowl, I step into the booth. Breakfast in Rogers Park’s Heartland Cafe demands a post-omelet photo shoot. While reporting this story, I climbed into every photo booth I could find. “Why don’t you try to get someone into the booth with you at each place?” suggested my editor. This turned out to be an exceptionally bad idea. At Woodmar Mall in Hammond, Ind., I found that even with business card in hand and the purest of motives, asking strangers to join me in the photo booth was interpreted as severely creepy. The photo booth experience, it seems, is a distinctly intimate one, yet that is part of its allure. The illicit sound of the curtain being pulled across the closet-size doorway, a thin barrier from public space, creates a sense of privacy — often bringing out the exhibitionist in people, says director Brett Ratner (“Rush Hour,” “Red Dragon”). Ratner installed a black-and-white photo booth in his game room and recently published “Hilhaven Lodge: The Photo Booth Pictures” (powerHouse Books, $35) a showcase of his celebrity houseguests. In Ratner’s book, a ghost-white Michael Jackson sticks his tongue out. A bespectacled Britney Spears makes moose antlers with her fingers. Edward Norton and Salma Hayek, dressed in formal wear, share the booth and a kiss. In Pilsen’s Skylark Bar, Just Joking Jerry — lawyer by day/performance artist by night — used the establishment’s photo booth to shoot pictures of himself with 100 different people. Naked. The rules: Both Jerry and his subject must disrobe, but the subject controlled the shoot and could do with the photos as he or she pleased. He thought the project would take him a year. Ultimate list of photo booth prop ideas is below. If you are having a photo booth at your upcoming event, then you should seriously considering adding some props into the mix. They are great at adding spontaneity to your pictures and encouraging guests to have fun. Some companies charge extra for this, while save you money by letting you bring your own. Honestly, all you have to do is rummage through you closet to get a bunch of photo booth props. You can even delegate authority to a family member or friend and have them be in charge of rounding up the props. The best way to get props is to go by a theme, time of year (aka holidays), or your personal preference. We have over 50 photo booth ideas listed below to help you get your creative juices flowing. If you have any recommendations, then add a comment below. We would love to hear from you! We all know the potential fun to be had in a photobooth, whether traditional or the new, open-air style. A group of people get together, in front of a camera, with some random props…how could you NOT have fun? But do a quick Google search on photobooth pictures over the years and what you start to realize is that a large majority of them look the same. And that’s understandable because, for the most part, when you get in a photobooth, everyone expects to make a few faces, wear a few random articles of clothing, and pose! Now we’re not doubting that people have plenty of fun doing that, or that the resulting pictures are fun to look at. But what if you could have an experience that was not only fun and produced decent pictures, but were unique and creative?! So that even people who don’t personally recognize the people in the picture respond with, “wow, that’s such a great idea!” or “wow, the timing there is perfect!”? If you’re at a wedding or birthday party, are there items that the host has placed in the decorations that can be used as props in interesting ways? This is often a great way to, not only use these “props” creatively, but also to add personalized details to the pictures that will remind the hosts of details – such as decorations & party favors – that they spent so many hours preparing for. When you keep your eyes peeled for details like this, everything and everyone becomes a potential prop and idea for a great capture! When you direct people in a photobooth, its important to take into consideration the personality of the people you’re working with. Are you younger or older? outgoing or a little more shy? are they athletic (enough, say, to jump or even throw people)? Some people are just bundles of creative energy and you’re able to just kind of sit back and watch the great ideas flow! Others need a little bit more input (or even prodding) to open up with some crazier ideas. Start by letting them try and idea/pose or two on their own and get a feel for what kinds of things they produce. Try offering little suggestions to what they’ve got (more intense facial expressions, more believable actions, more interaction, less pose-y, etc). If they seem open to direction, break out some of your crazier ideas! For this purpose, we’re constantly brainstorming ideas for new poses, stories, and ideas, so that when we come across the right kind of group in a photobooth, we’re ready to go! Remember that great, crazy picture ideas are somewhat relative. If you can get normally reserved grandparents to open up and get just a little goofy, success! By taking the personalities that come and helping them to kick it up a notch (even if it is literally only one, little notch! ), chances are you’ve got yourself a shot that will be remembered! Who knows, they may even come back for more! Medium sized groups (6-10 people) starts to get a little trickier. Action shots, such as everyone jumping, are more out of the question due to the potential of injury or an unwanted kick to the leg! Rather, shots that direct your attention to a specific person, such as “Everyone cheer for the bride and groom while they kiss!” or “Carry this person and act like he’s incredibly heavy!” are what makes the picture “WOW” worthy. Large sized groups (11-15 people) are definitely a challenge, but well worth it when everyone in the group is willing to get a little crazy and all participate in on the fun. This is where expressive faces and everyone doing the same thing come in handy. “Everyone stick out your hands and say ‘ROAR!’” or “Stick out your tongue and try to touch your noses,” all make for hilarious shots that make the group want to do more! Another way to put it is, “don’t just take a picture, tell a story!” While random action can be lots of fun, often the best photobooth pictures are the ones where your eye is drawn into some action or flow of thought and leads you through the picture as you follow the “storyline”. Just because a picture captures a single moment in time doesn’t mean that picture itself needs to be of a static pose! You can never go wrong with injecting a bit of action into a shot! Whether its faking a move out of a video game, tossing a poor guy high up in the air, or even the tried-and-true, coordinated jump, getting people moving around with some fun action always brings up the energy and fun, and leaves you with some great captures! So there you have it, 5 simple tips for posing people in a photobooth. This list definitely isn’t comprehensive, but hopefully it gets you started with some different ideas! If you’ve got some ideas that we didn’t mention, or would just like to share some of your crazy photobooth pictures, we’d love to hear them! 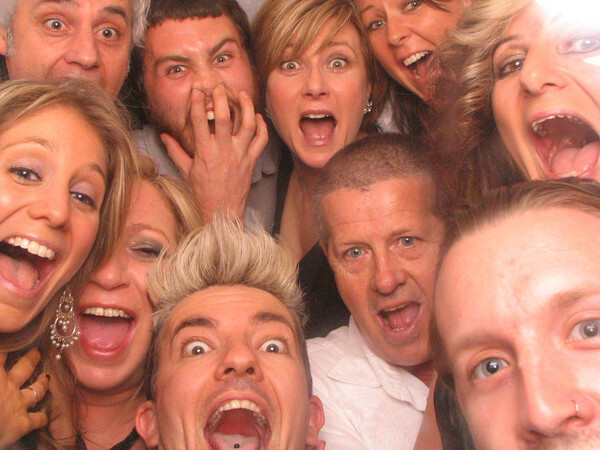 Check out the photo below… we managed to fit 10 people into a single photo booth photo. I was talking to someone the other day who said they had a photo booth at their work Christmas party and they weren’t very excited about it… why?… they struggled to fit more than 2 people in the booth. Half the fun is squeezing in your whole group of friends! Photo booths are back in FASHION! They’ve been amusing preteen girls for decades. Now, photo booths — those $2 wonders often found in the corners of food courts — are moving up and out of the mall. The old-fashioned booth is fast becoming a regular on the party circuit, thanks to its fun factor and its ability to dispense one-of-a-kind favours. Like so many trends, this one has its roots in Hollywood (Jamie Lee Curtis rented one for a birthday party and Quentin Tarantino has one installed in his home), but expect to see it soon at a bat mitzvah near you. On the small screen, red-carpet coverage for both Entertainment Tonight and eTalk Daily regularly includes “candid” celebrity photo-booth snaps from awards shows and parties. And at the recent Live8 concert a photo booth was there for the fans to record the event. Aside from sheer entertainment value, photo booths allow guest and host alike to capture unique instant memories in simple strips of pictures, all for a mere couple of bucks. And while booths haven’t yet usurped the traditional wedding photographer, http://www.cheekyphotobooth.com.au/ plans to equip weddings, bar / batmizvahs, corporate functions and any other event throughout Sydney. While photo booths have provided pop culture with some memorable moments — in 1978, Clark Kent (a.k.a. Christopher Reeves) changed into Superman in a booth supplied by Auto-Photo — they have seemed largely forgotten in recent years. Now, they’re popping up everywhere, in ads for birth-control pills and chewing gum, boutique hotels as well as films such as the recent Ashton Kutcher flick A Lot Like Love. Along with a photo booth, the company supplies a “scrapbook co-ordinator” who arranges for wedding guests to add personal notes to the photos to create special keepsakes for the bride and groom. Even the colourful Cirque de Soleil insisted on an old-school booth for its Christmas party last year. The business world is catching up, too, renting photo booths to amp up the “party” atmosphere at corporate events. The company ensures a branding opportunity by adding the company’s logo to the photo paper in advance. There’s something undeniably tempting about looking at photo-booth pictures. It’s a great human moment.